It’s pretty common knowledge that thermoformed packaging is tough to open. Especially if the edges are factory sealed, or there aren’t easy-to-understand opening instructions. I thought it was just one of those things. You know, like ‘dogs chase cars’ or ‘bees sting.’ But now I know it’s not just a thing, it’s a Thing. Wikipedia defines Wrap Rage as “the common name for heightened levels of anger and frustration resulting from the inability to open hard-to-open packaging.” It’s further defined as any packaging that claims to be easy-open but is, in actuality, nearly impossible. Such was the case of a vacuum-packed sausage for columnist Lori Borgman. She had to go through two sets of shears to get at her dinner. Speaking of shears, products are even banking on wrap rage for their marketing plan. 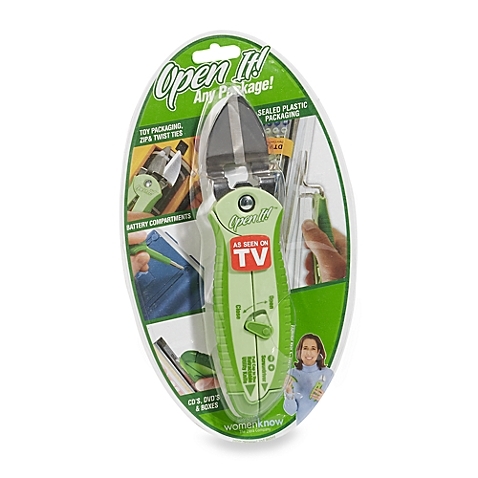 A cursory examination of one wrapragecure.com will eventually reveal itself as an advertisement for a product called the Open It™, a fancy-schmancy scissors for opening blister packaging. However, the irony is not lost on me that the Open It™ itself is encased in one of the tightest thermoformed plastic bubbles I’ve ever seen. A chicken-or-the-egg scenario if I ever saw one. But even Borgman, sausage sufferer extraordinaire, admits that blister packaging is a necessary evil. Why? Because it’s still one of the top theft deterrents on the market. Or rather, in it. Blister packs and retail go together like peanut butter and jelly. Gold standard. As much as we may dread the eternal struggle that comes from purchasing a blister-packed product, we know that the reason the product was even there to purchase is because that plastic bubble protected it. Products in stores aren’t supposed to be easy to open! Hello! It’s a sad fact that folks will steal anything not nailed down. I knew someone back in high school that stole display frames from eyeglass stores. For Display Only printed on the plastic lenses and all! But much the way animals know to avoid electrified fences, we humans know not to bother with stealing blister packaged items. The battle too exhausting, the sound too loud, and the risk too great. Therein lay the beauty of custom blister packaging. Not too mention the reasonably low cost of thermoformed plastic packages means that virtually any product can enjoy the protection. Because people steal low ticket items too, let’s be honest. So even though wrap rage is a thing, we all accept it. And there are options to making even hard-to-open packaging into easy-open. (Clear instructions being a biggie.) So next time you nick your thumb trying to open that pair of headphones, replace that expletive with a hearty Thanks, Blister Packaging! You’re just doing your job! I get it!